The buzz is growing for an Al Gore nomination. Check out Howard Kurtz's bloggy thing in the Washington Post. Kurtz starts out by talking about Gore's appearance on Saturday Night Live. The video clip is available here. This is way better than Joe Who returning to lead the Permanently Constipated Party back in the 90's. Not that I didn't like Joe when all was said undone. But "I like Joe" doesn't have quite the same ring as "I like Ike". 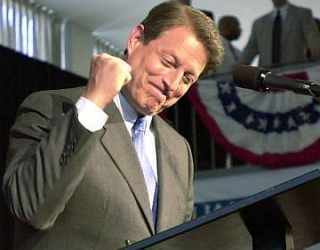 How about "I'd like to see Al Gore the Republicans in '08! "?